Another link to Gordon’s golden era of the 1950s has been lost with the death of Ken Yanz, an icon of the time both for the achievements his Rugby brought him and the way in which he played it. Ken started with Gordon as a teenager from the Lane Cove club in 1947 and was still going in 1964. In between times he played 181 first grade games, was a member of two of the four first grade premierships Gordon won between 1949 and 1958, made the Wallaby grand tour of Britain, France and the Americas in 1957-58, and played one Test match. For those who saw him play, he is remembered as a fierce competitor . . . a flanker with an uncompromising edge to his game that brought him plenty of respect, and plenty of trouble. Yanz fitted sweetly into a Gordon era that was renowned for its toughness. Their game was based on a grim set of take-no-prisoners forwards, which suited Ken fine. They set the platform for backs of the calibre of Arthur Summons and Jim Phipps and defined a game that made the club pretty much unbeatable. In Ken’s time flankers were almost exclusively defensive players whose prime responsibility was to make life unbearable for opposing five-eighths. Yanz played that role with relish. Arthur Summons always said one of the best things about his Rugby career was that Ken Yanz was always on the same team, and that he never had to play against him. It was, of course, a different game back then. Without the intrusion of television cameras and TMOs, and with a more universal acceptance from referees that contact sport would involve a few indiscretions, Ken always managed more indiscretions than most. He made rivals very wary of him and saw such aggressive Rugby simply as part of his job. It certainly gave his team impact. 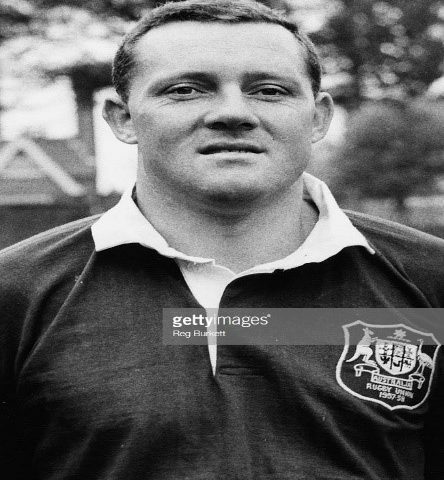 Ken was one of six Gordon players to make the 1957-58 Wallaby tour to Britain under the captaincy of his club captain-coach Bob Davidson. Ed Purkiss, Don Logan, Arthur Summons and Jim Phipps were the others. The club surely would have won another premiership in 1957 had not the committee taken the decision to stand down all six from the grand final, lest injury cost them a wonderful life experience. Ken was a key member of the 1956 1st Grade premiership side, arguably the best combination Gordon fielded in its first 50 years. The 1956 side contained such great players as Maurie Graham, Peter Phipps, Arthur Summons, Don Logan, Eddie Purkis, Alf Hancock, Ron Sevenoaks, Ian Miles and Bob Davidson. Gordon beat St George 13-11 in front of 13, 624 spectators at the Sports Ground. In 1958, he again tasted premiership glory defeating Manly 13-3, in a match of many notable achievements – Bob Davidson and Ian Miles’s last games for Gordon, and Ken’s 101st 1st Grade game. A story that has become club folklore surrounds a match at Chatswood Oval in the 1950s between Gordon and Sydney University. In those days the final whistle was the signal for the playing of the national anthem – God Save the Queen – and religiously the players stopped and stood rigidly to attention as they left the field. This particular day Ken Yanz had been in holts with a University rival who by chance happened to be standing beside him, arms stiffly by his side, as the anthem was played. Yanz couldn’t help himself, darting out a left jab which felled the University player. As the student lay prone, Ken resumed the rigid attention stance that the anthem demanded, eyes dead ahead, and nobody moved until the music stopped. It was the last time they played the national anthem at a home game. Ken was a happy presence around the club in his playing days, a jovial fellow off the field, if a bit of a villain on it. His support for the club was lifelong. He remained a much-revered figure, reflective of a wonderful era in the life of the Gordon Rugby club. Thank you to Gordon Life Member Norm Tasker and Bill Currie for these wonderful memories of a great Gordon man. Our thoughts and prayers go to Ken’s family. Ken’s funeral will be held at Macquarie Park Cemetery and Crematorium at 1pm next Tuesday, 12th February 2019. “When you have worn the Gordon Tartan, you never Walk Alone”.